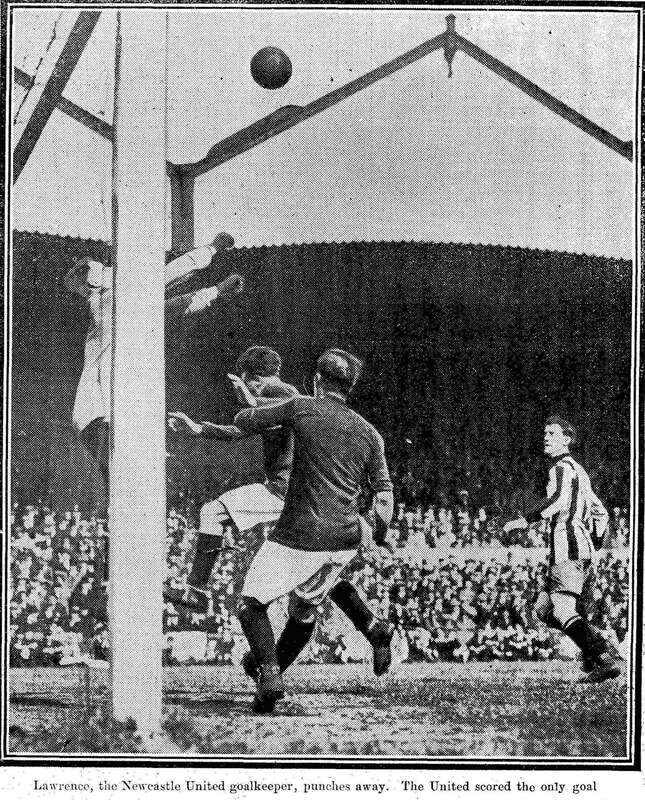 The game against Newcastle on Saturday 30 August 1919 was not only the first competitive game since the Great War ended but also the first League Division One match played at Highbury. Consequently this excitement led to queues at Kings Cross on the day of the game being six deep for the tube to Gillespie Road and snaked all the way to the St Pancras train station. 18 of the 25 playing staff had served and The Arsenal gave free seats to men wounded in World War 1, at a loss of approximately £100 per match at a time when the club needed all the money they could get. This patriotic policy was engineered by the Arsenal directors, of whom Charles Crisp, George Davis and John Humble saw the game, but neither the real power brokers: Sir Henry Norris nor William Hall were mentioned as attending, despite them recently using £5,000 of their own money to upgrade the ground. 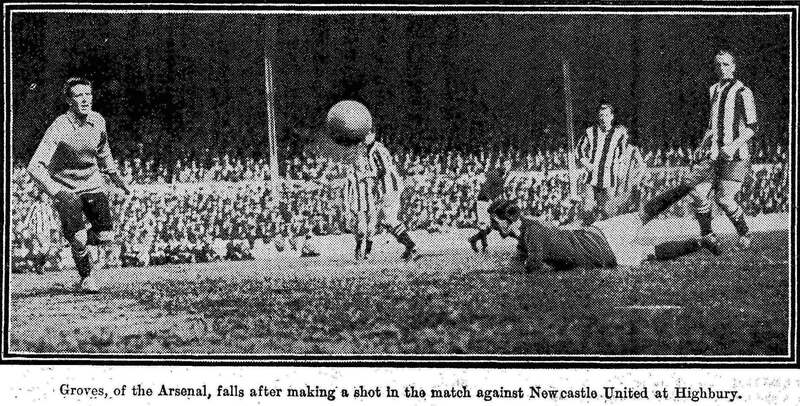 The game ended Arsenal 0 Newcastle United 1, with the Magpies scoring through their only meaningful shot of the afternoon, but the football itself was the least newsworthy of the events of that day. The gates had been shut before kick-off with estimates of the crowd varying between 40,000 and 60,000 inside and many thousands more having difficulty obtaining entrance. Just prior to kick off some gates were forced open allowing many of the throng outside to push in and gain entrance without paying. This ‘invasion’ combined with thieves trying to hold up and steal the gate entrance money leading to fighting on the terraces with a stream of punches from those charged with protecting the club’s money aimed at the robbers. There was also trespassing onto private premises prior to scaling walls into the ground. For all the disturbances in and around the ground there was only one case heard by the magistrates on the following Monday. 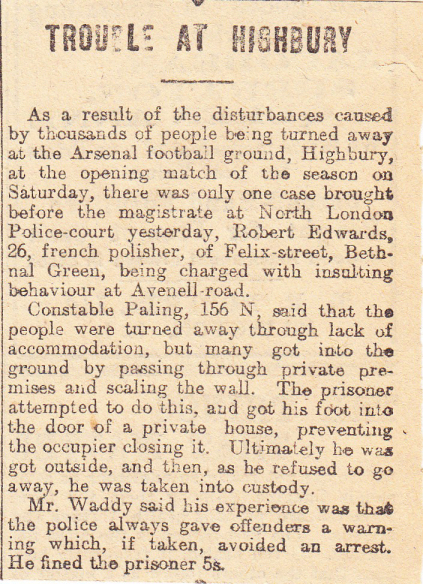 This extract from the Islington Gazette shows not just the French polisher Mr Robert Edwards getting caught trying to trespass into someone’s house that abutted onto Highbury, but also that he was the only one charged, probably because he became abusive towards the police. The chaotic scenes meant that many were turned away at the entrances but scaled walls and went through houses to watch the game. Presumably many barged in like Mr Edwards but no doubt some entrepreneurial residents made some money from the keen spectators. 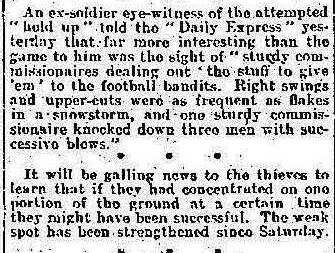 The Daily Express received 100s of letters concerning the disturbances and published one from “One of the Robbed” on 6 September who interestingly stated among other points that the ground was not full, but due to poor design at entrances and a lack of adequate gangways gave the appearance of being so by causing bottlenecks at the entrances. ‘One of the robbed’, agrees with the ex-soldier’s evidence that a gang of thieves tried to rob the takings from a gate, however he makes it clear he believes in the wider sphere the club robbed him. 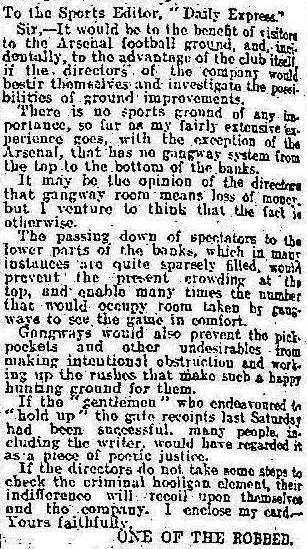 Finally, Sir Henry Norris launched a typically robust response a few days later, but with the tacit acceptance that the stadium needs far more work to get it up to a good standard.